Now, nanoscientists can order up premade carbon nanotubes in order to shorten their time in the cultivation stage and spend more energy in the application effort. In 1996, Rice University studies successfully developed a rapid production of the single walled nanotubes. This has allowed scientists to simply submit an order and receive the necessary raw materials for creating new and improved scientific strides. The ordered nanotubes are created through a process of laser vaporization. The laser vaporizing process targets the carbon particles and is confined to a 1200 degree Celsius furnace that in effect “grows” the nanotubes. There is a specific catalyst of cobalt nickel is part of the growth process. The idea is that the cobalt nickel helps the growth process by preventing the capping of the nanotubes so that they have the opportunity to grow into long tubes in a short period of time. 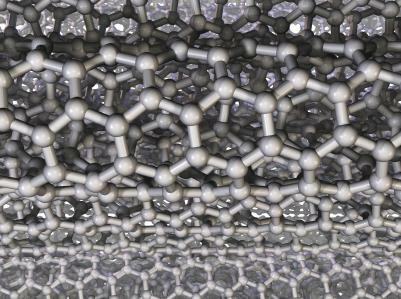 The carbon that is targeted this way can be manufactured into nanotubes between 70 and 90% of the attempts. Two separate laser pulses are effective at helping the growth continue over longer periods of time, which helps produce larger nanotubes in a shorter period of time. It is vital that the growth process is controlled in order to maintain some sort of uniformity in the manufactured nanotubes. This is important when it comes to scientific research. Research is naturally more effective when the nanotubes are the same size and width for the project. The nanotubes are then removed from the superheated furnace via a constant flow of argon gas that ushers the nanotubes directly into a cooling chamber in a copper nanotube collector that is cooled by water. This stabilizes the process and gets the microscopic tubes ready to be delivered to the scientists in need of the tubes for experimentation and application. A few years later, the University of Montpellier, France amended the process of how nanotubes are made. The production of nanotubes were based on the same need, but the process of manufacturing them was altered in an attempt to get the orders filled with more accuracy in less time. Ionized carbon is still targeted and the superheating of the discharge has been shown to grow nanotubes in a controlled and quick manner. There are many other scientific groups that are now altering the original two methods and using them in combination to mass produce carbon nanotubes for scientific experimentation. With the increase in demand, many different collaborative efforts (even internationally) are merging to attempt to continuously improve the quality, accuracy, and uniformity of carbon nanotube production. This entry was posted on June 19, 2009, 2:36 am and is filed under nanotubes. You can follow any responses to this entry through RSS 2.0. You can leave a response, or trackback from your own site.